HomeblogAsk RayAsk Ray | How do you gauge if strong AI is a few years away? Ask Ray | How do you gauge if strong AI is a few years away? I’m currently in the middle of How to Create a Mind. I’m struggling with this one a bit more than you’re other books, but it’s very enjoyable and elucidating. 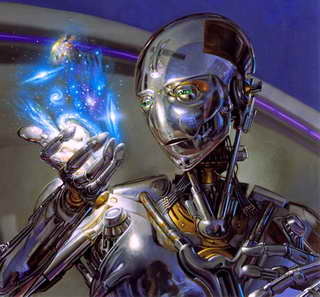 You have for some time predicted human level machine intelligence arriving by 2029. However, in Mind you estimate the speed of a computer necessary to simulate the brain at 100 trillion cps, and state that the latest supercomputers achieve this speed. Which means that very soon we will have a machine with twice the necessary power, then quadruple, and so on. If four or five years from now we have a computer of ten times the necessary power AND there emerges a well-funded, collaborative effort to simulate a brain on such a machine, would you amend your prediction of the emergence of strong AI? I guess what I mean to ask is, what developments would you look for to determine that strong AI is only a few years away? I’ve always expected to have the hardware sooner. By 2020, the requisite hardware will be very inexpensive. The software is the gating item. Developments such as Watson should give us confidence that we are on track.